So this weekend just gone I had a visit from my old friend Gavin, who is also an old hand at model making. Gav was the first person to convince me I should try using oil paints in my modelling. He lives in the Blue Mountains, about an hour out of Sydney, and it was great to have him visiting Melbourne for a lightning fast weekend visit. In among martinis and discussing military history, we also chatted about models. Gav is mainly a figure painter, and I have been in awe of his work for many, many years. I have been trying this weekend to convince him to come back to modelling 1/35 armour and dioramas. I wanted to share a couple of photos of a 1/35 WW2 British officer which Gav painted in a day on his last visit to Melbourne, back in early 2015. I was working on my Stuka at the time, and we had a great day building and painting together. Here is Gav's work. I'm always impressed at his lifelike skin tones and his paint blending skills. It's an old-school white metal kit. Gav "The Modelmaster" at work in 2015. And here is a photo from this weekend just gone. 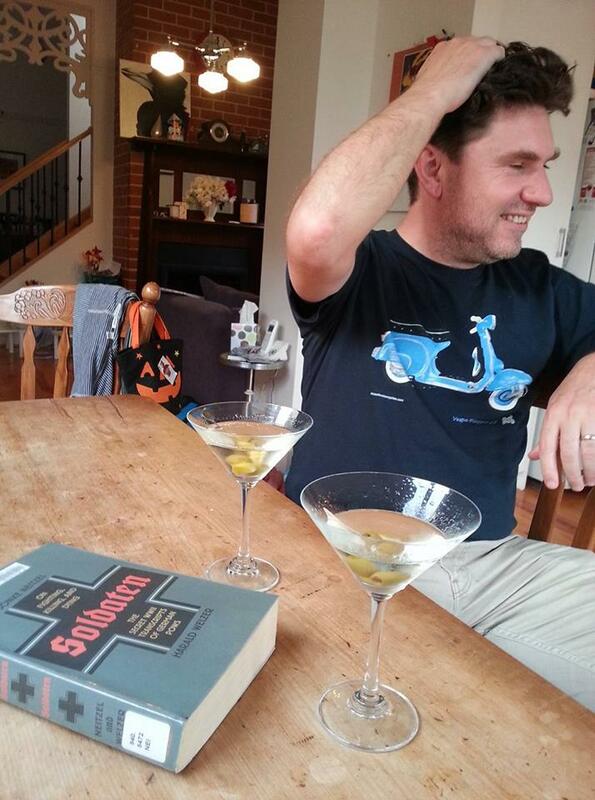 Yep, martinis and military history.